There was an article early march on npr called Oberoi's Kitchen: The Art Of Indian Haute Cuisine. It featured several recipes and talk of a traditional workman's lunch called atta chicken. It is a featured dish in this chefs restaurant but he did not give the specifics of the dish. I have searched everywhere for a recipe. Can anyone describe this dish and/or give a general idea of how it's made? Apparently a lot has changed since this question was first posted exactly five years ago today. 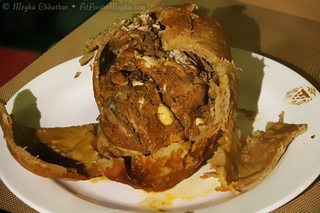 Today a simple Google search yields many recipes, a lot of lore, and lots of pictures. But, I suspect that one has been very much prettied up for the camera. This one is from the blog Fit Foodie Megha, which does restaurant reviews. The chicken was prepared by a well known and apparently very highly regarded restaurant called Punjab Grill in Phoenix Market City, Pune, Maharashtra, India. Here is an example from the blog Chandigarh Chaat showing perhaps the original variation from Kotkapura, near the Indian border with Pakistan. 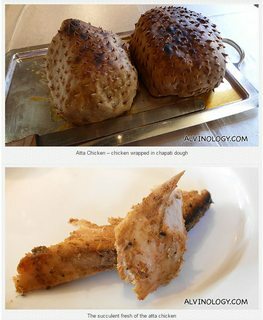 That one was prepared one year ago by the world class chef Hemant Oberoi, who the blogger credits with making Atta Chicken famous beyond Kotkapura. Not coincidentally, it is Chef Oberoi who the OP learned about on NPR and inspired the question here. I watched the videos and read the recipes. The original Kotkapura recipe is still a closely guarded secret, but a number of foodies have published their take on it. To paraphrase: Take a clean chicken and score it (or not) on the breast and thigh. Other recipes say prick the chicken with a fork. Marinate it in a heavily spiced (usually yogurt based) marinade for hours. Some recipes do that in two steps, one in a dairy based marinade, the other in an oil based one. Stuff the chicken cavity with some combination of almonds and/or pistachios and whole garlic cloves. Wrap the chicken tightly in muslin, cheesecloth, or in at least one recipe, banana leaves. Although in the banana leaf recipe, the cooking method is quite a departure from the others. Make a simple dough with just whole wheat (atta) flour and water, perhaps salt. Completely encase the chicken with at least a 2 centimeter layer of the dough, carefully sealing (that's critical). Now cook it in a tandoor (which is the Kotkapura method) for at least two hours or until the dough is completely charred. You can also do it in a barbecue or a very hot oven for approximately three hours, again until the dough is completely charred. Three hours seems like a long time at such high heat, but if you watch the videos or read the blogs, they all seem to agree that long and hot is the way to go. When it is done, don't break it until you are ready to eat it. Supposedly it can be kept at room temperature for three days if it hasn't been broken into. I am more than a bit skeptical about that, but I'm just repeating what I've read. Refrigerated and unbroken, the chicken is supposed to be good for up to two weeks. Just rewarm it, then break into it. Discard the cooked dough. The chicken supposedly divine, and very, very juicy. If you found this information interesting, you might also enjoy watching this video, which is very coy about the super-secret Kotkapura recipe, but shows a lot of the fun stuff including breaking into the chicken. Atta chicken [...] has been a closely guarded recipe which involves marinating a dressed-up chicken with specially-made spices, tightly wrapped in a muslin cloth with a thick covering of kneaded flour and roasting in a slow-fire oven. 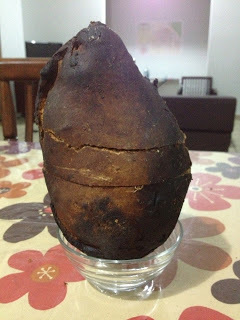 Once the flour shell hardens and turns black, it is gently cracked up and the chicken is served steaming hot. An unbroken atta chicken can be stored for up to two weeks in a refrigerator, without any loss of flavour. Not the answer you're looking for? Browse other questions tagged chicken indian-cuisine or ask your own question. What main course Indian cuisine I can make out of potato with sweetness in nature?